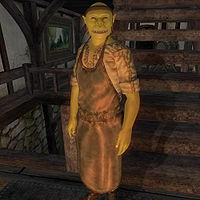 Magra gro-Naybek is an Orc general merchant at Borba's Goods and Stores in Cheydinhal. He sleeps in the basement of the store between midnight and 6am, and eats in the main store area between 8pm and 10pm. At all other times he walks around the main floor of Borba's store. He wears blacksmith's pants and apron with stitched leather shoes, and carries the key to Borba's store and a few gold coins. Magra is defined as a merchant but none of his AI packages allow him to offer services. Installing the Fighter's Stronghold plug-in adds two hours of service, specifically between 8pm and 10pm when he is scheduled to eat. Due to his key not being tied to the basement door, Magra will often end up stuck in the basement.